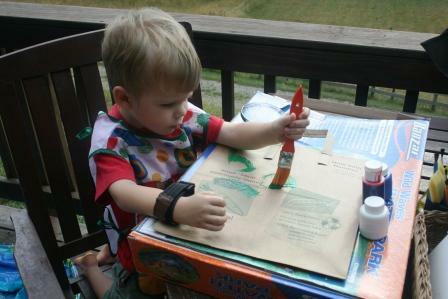 Pierce and I wanted to find a way to make a craft from recycled brown paper bags. We found inspiration while reading the book Brother Eagle, Sister Sky by Susan Jeffers. This is a beautiful children's book, rich with pictures and the words of Chief Seattle as adapted by Jeffers to become preschool-friendly. The shining water that moves in the streams and rivers is not simply water, but the blood of your grandfather's grandfather. This we know: All things are connected like the blood that unites us. We did not weave the web of life, We are merely a strand in it. Whatever we do to the web, we do to ourselves. Just a small taste. If you care about the earth, go to the library and read this book to your children. Share with them what value our world of nature has. And then follow it up with a little recycling fun! Pierce picked out the colors himself. After drying, cut out shapes for eyes and mouths and wings. Pierce colored the wings a mixture of colors. We looked at some of the totem poles online of Pacific Northwest Native American tribes. We gathered chicken feathers (we have no shortage of those right now) to add a little flare. 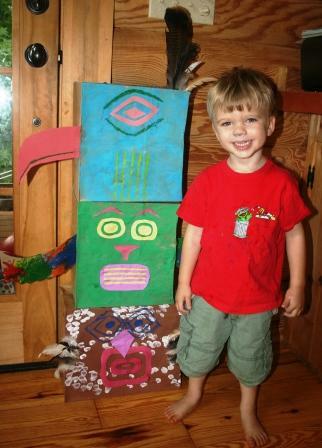 You could make your totem pole as tall or as short as you wanted. 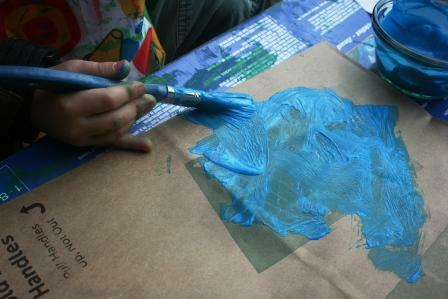 A really fun craft with a much deeper lesson. what a great (& GREEN!) idea! he is such a cutie! What a great idea. I love the photo where he's concentrating so hard on his artwork. We're going to have to check out that book from the library, because Liv likes a couple of her other books. A favorite book of hers in my house is "My Chincoteague Pony" - have you seen that one? What a great and fun way to spend today!